The kukri that played a very significant role in shaping the world during the Second World War, therefore the name "Historic." This khukuri is a very famous knife among tourists and collectors because of the fact that it was actually used by Gurkha soldiers/army during the Second World War. It is the exact replica of the Mk III that was used in the world war era. This khukuri/kukri knife played a very significant role in creating the history and therefore the name "Historic". It is differentiated from the older Mk I by its lack of a handle nut and a different blade shape. The documented source and collectors say that all khukuris/kukris initially used were made in world war version. It is believed to have the original shape and size of a khukuri/kukri. 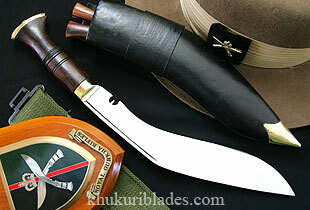 This knife is slightly larger and more curved than the current khukuri/kukri issued to Gurkha soldiers/Gurkhas.